It's a snow day everyone! My favorite kind of Monday :) :) :) Since I'm currently snuggled under a fuzzy throw, I thought I'd share with y'all how I've been displaying my objectives this year. It's been working really well for me so maybe it will help y'all too. 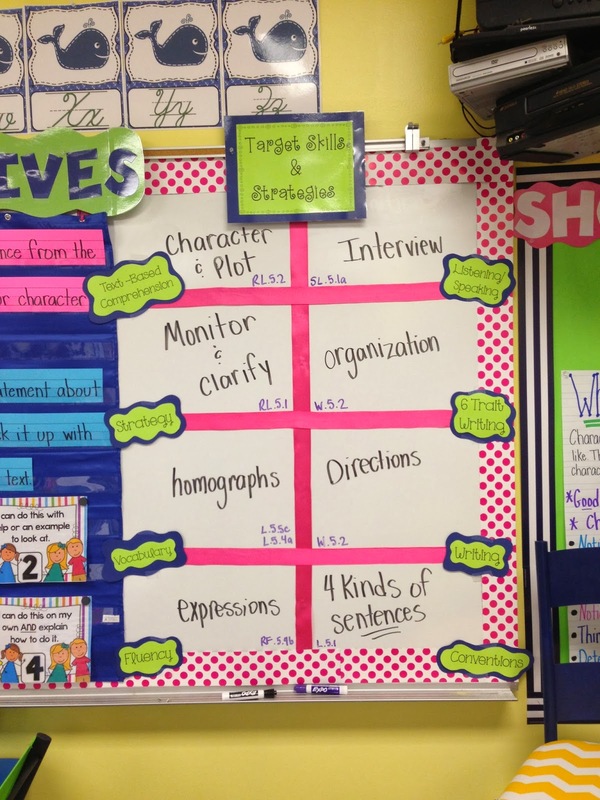 These objectives are for my fifth grade class, but the way I display them will work for any grade. I teach reading/language arts/spelling, so that's why there's no objectives for math, science, or social studies. I have one objective and one essential question for each day. When I start planning for my week, I start out by writing the objective for each day of the week. This helps me plan activities for the day and I'll know that if I have a surprise observation, my objective and essential question directly correlates to what I'm teaching. I sectioned off boxes on my whiteboard and labeled each box. 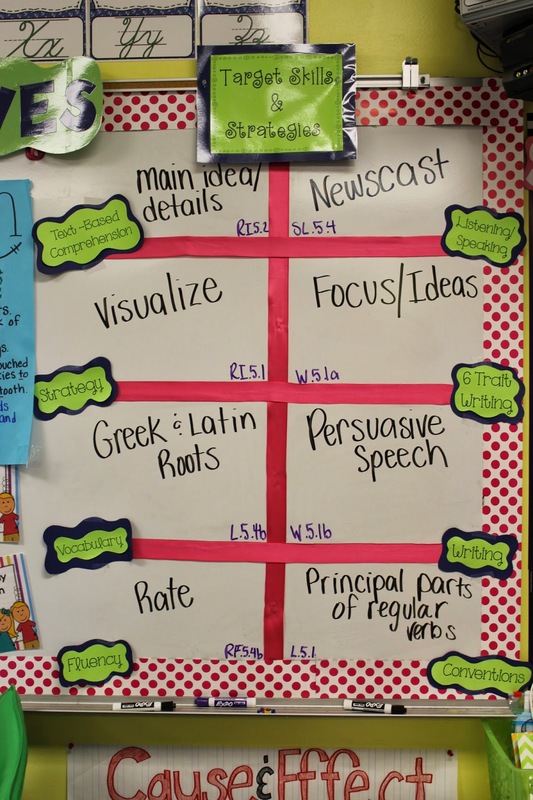 Each week I write the target skills and strategies and also include the CCRS in each box. I use to display my objectives on this pocket chart, which I LOVE. It fit perfectly between my target skills and strategies and my SmartBoard, but it was just too much trouble to drag out the sentence strips, write the objective and essential question for each day and place them in the pocket chart, then change them out each day. So, I sadly took the pocket chart down and simply wrote the objective and essential question on the white board next the the titles/headings. It doesn't look as pretty, which I'm trying to forget about it because it is MUCH easier this way. I've started writing my essential question on this little pink white board that's magnetic. I can quickly write the question and display it and the kids know exactly where to find it since it sticks out. Maybe this helps you get a little idea of how I display CCRS correlated objectives and target skills in my classroom. It's working really well for me so maybe it will for you too! Love your colourful room and how you organize your objectives! This is an awesome post! I also have an objectives board in my room, but have not focused much on updating it daily (or weekly). This is great motivation and looks so easy! Thank you for the inspiration! I hadn't any objective board in my room, but after reading this post, i have decided to have one. seems as if it is highly motivational and helpful. i can use it for my sister who's on HOP.